Stress relief. Almost every employee deals with some sort of stress on a regular basis – which is why workplace stress is such a prevalent issue in today’s society. Keeping a plant at your desk can help reduce some of this stress and improve your mental wellbeing. Caring for your plant is a relaxing hobby, plus, adding some greenery to your workspace has been shown to help fight anxiety. Air quality. We all learned at a young age that plants produce oxygen and absorb carbon dioxide. They also help improve air quality by removing harmful chemicals from the air – like benzene and formaldehyde – to help make the air cleaner to breathe. Breathing in cleaner air and more oxygen every workday will help keep you energized and healthy. Creativity. Everyone needs some help getting their creative juices flowing every once in a while. Having a desk plant can do just that! The science behind this finding suggests that the color green is responsible for the boost in creativity. The color green sparks creativity because it reminds us of nature – which is stimulating to the mind. Mood. Indoor plants promote happiness and can have a positive impact on your mood. Images of nature have been scientifically proven to help relax and stabilize your mood. When you’re in a better mood at work, you’ll feel mentally healthy and ready to tackle the day. Productivity and work performance. Want to feel a bit more productive at work? Bring in a plant! Studies have found that seeing plants in your workspace helps you stay focused and energized, which allows you to accomplish more and feel more productive. Snake plant. These plants are extremely hard to kill (perfect for beginners!) and can go days without water. They’re also great at growing at room temperature. Lucky bamboo. Lucky bamboo is a great plant for beginners. They require little watering and maintenance. Plus, if they start to get too tall, you can easily trim the stalks with a pair of scissors. English Ivy. While you will need to water this plant frequently in the beginning, this plant gets easier to care for over time once it has adapted to dry conditions. Plus, they’re beautiful! Cacti. Choose this plant if you have a desk near a window with some natural sunlight. They only need to be watered about once a week during warmer seasons and once every three weeks during the cooler seasons. Lemon Balm. These scented plants can survive in the sunlight or in the shade and are difficult to kill. You’ll love the added boost you’ll get from the scent of lemon at your workspace. Succulents. These tiny plants are as versatile as they are beautiful. And they only need to be watered about once a week! Aloe plant. These plants are very forgiving if you forget to water them. In fact, watering them too much is worse than not watering them at all. They also one of the best desk plants to help purify the air around you. 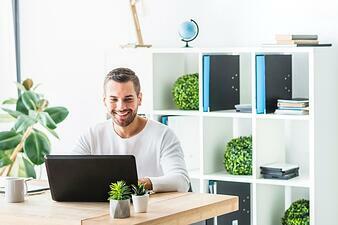 Adding a plant to your workspace is an easy way to boost your overall wellbeing at work. Do you keep a plant at your desk? Let us know in the comment section below!